^ a b Itzkoff, Dave (April 2, 2012). "Footnote". The New York Times. Retrieved 3 April 2012. ^ a b Ng, David (April 3, 2012). "Can Neil Patrick Harris boost Tony Awards ratings?". Los Angeles Times. Retrieved 3 April 2012. ^ Gans, Andrew (January 17, 2012). "66th Annual Tony Awards Set for June 10". Playbill. Retrieved January 12, 2012. ^ Healy, Patrick (January 17, 2012). "A Date for the Tony Awards". The New York Times. Retrieved January 17, 2012. ^ Gans, Andrew (April 3, 2012). "Neil Patrick Harris Will Host 66th Annual Tony Awards". Playbill. Archived from the original on 2012-04-13. Retrieved April 3, 2012. 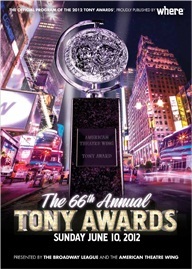 ^ a b "The 2012 Tony Awards® to Feature More Performances Than Ever Before!". TonyAwards.com. June 7, 2012. Archived from the original on 2012-06-07. Retrieved 7 June 2012. ^ Gans, Andrew (March 12, 2012). "Recipients of Tony Honors for Excellence in the Theatre Announced". Playbill. Archived from the original on 2012-03-14. Retrieved March 12, 2012. ^ Gans, Andrew (April 10, 2012). "Emanuel Azenberg Will Receive Special Tony Award for Lifetime AchievemenEmanuel Azenberg Will Receive Special Tony Award for Lifetime Achievementt". Playbill. Archived from the original on 2012-04-13. Retrieved April 10, 2012.